I can’t believe what I’m about to write. This Sunday is Super Bowl, and I’m excited about it. Since when do I give a “rabano” (radish) about American football? I always thought it was such a violent nonsense sport with a flawed name (shouldn’t it be handball or bodyball or let’s-kick-each-others-asses-ball instead?) But as change is the only constant, here I am, living in NYC, and awaiting Sunday’s game with expectation. The New York Giants are up against the New England Patriots, so one ends up sympathizing with the city and it’s people, and getting emotionally involved by default. I also have been watching a few games in the past weeks, with a patient boyfriend by my side explaining the players’ every move, so at least I now know what’s going, and don’t get painfully bored by it. It’s even kinda fun, but shhhhh!!!!! Don’t tell anyone! So I’m gonna watch the Super Bowl this weekend with a few friends, and as I do in every other aspect of my life, I’m gonna focus on the food, of course. For Sunday’s game I thought one of our simplest, easiest, cheapest, and most delicious piqueos (hors d’oeuvres) would absolutely nail it as the ultimate game-watching finger food. Perfect to be accompanied by a few beers, and to get one’s appetite going if more food is on the menu. And this country is the french fries meca, so a little deviation from that –fried yucas– will surely keep everyone around happy. 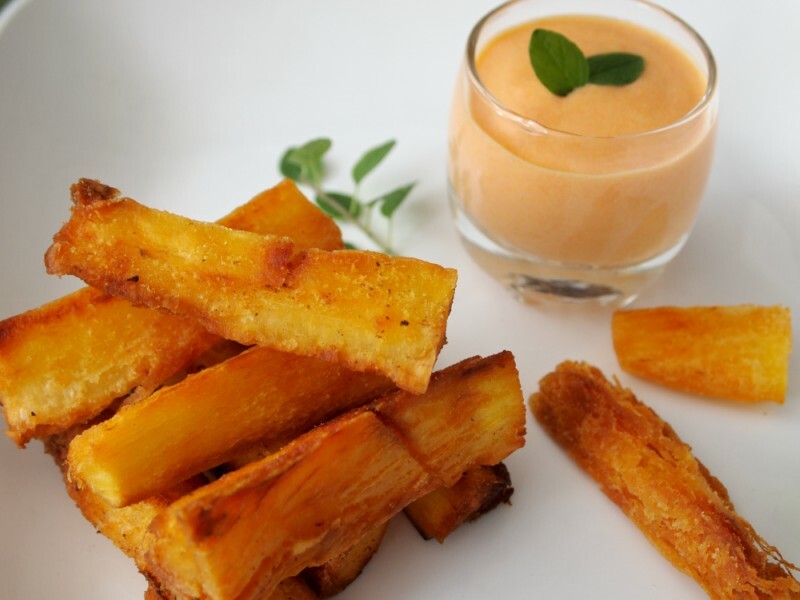 In Peru we use any excuse to nibble on yuquitas fritas (fried yuca sticks), with some of our favourite sauces (huancaina, ocopa, rocoto sauce , aji sauce, guacamole…). The secret for finger licking fried yuca sticks is to boil them in advance, then cool, cut, and freeze for a few days or weeks, and when you want to make them just take the frozen sticks out and fry them without previous defrosting. 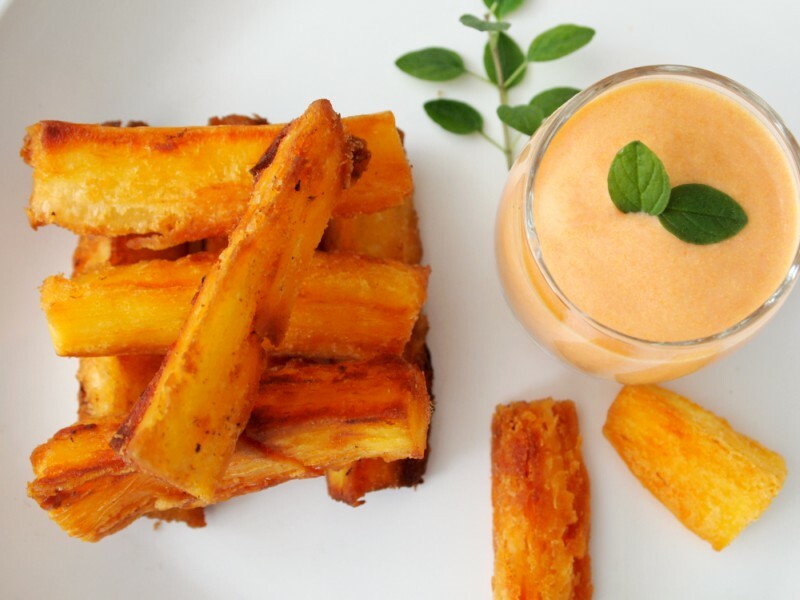 The result is a wonderful creamy yuca, with a golden crispy crust, made in a few minutes. What could be better than that? 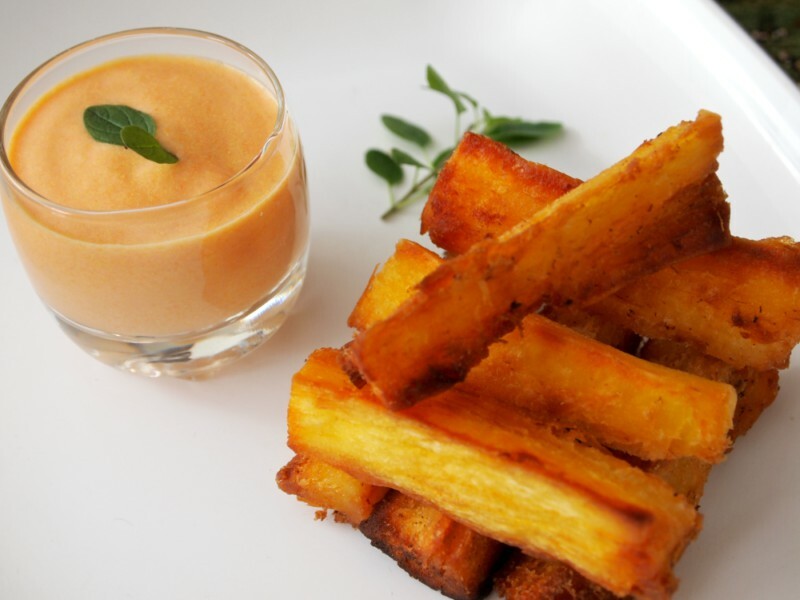 Fried yuca sticks with fiery rocoto sauce. 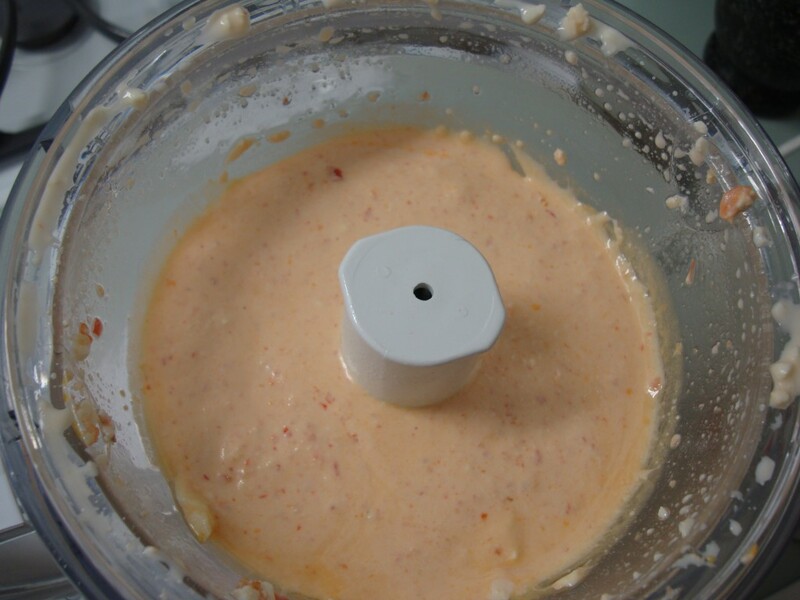 To make the rocoto sauce: In the blender process cheese, rocoto, vegetable oil, until creamy or a little chunky. Season with salt and pepper. Reserve. Peel the yuca, and cook in salted water with the garlic cloves until tender. Strain, let cool and cut in sticks. Heat 1 inch oil in a saucepan, and when hot, fry the yuca sticks, a few at a time until golden. Drain on paper towels. Never had these, but I sure have had rocoto sauce and I love it! 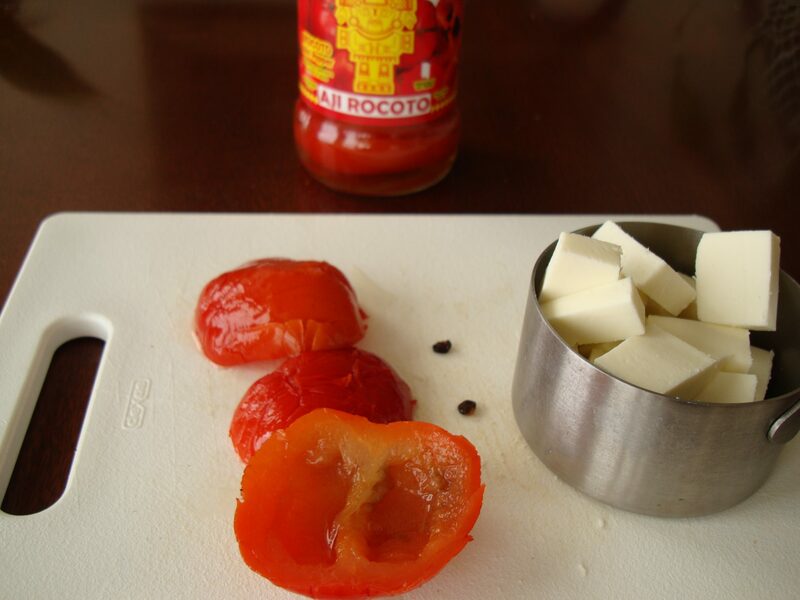 Yeah, rocoto sauce really works for many things, not just the yucas. Some Peruvians put it on pretty much every dish. Me encanta la yuca!!! Esta sí la tengo que probar. Gracias por la receta (y qué bellas fotos!). Gracias Pamela! Nos cuentas como te salieron. Now that the Cowboys are out of it, we are less excited about the Super Bowl. But I’m sure that it will be on in our house anyway. This looks like an incredible recipe. Thanks for sharing it! Girl! I can’t believe that we blogged about the same thing! Well, you dedicated a post to these absolutely yummy fries.. and I gave it a three-liner. But, any mention is worth it. They’re the perfect snack for tomorrow! And the sauce I make to dip mine into is actually a Peruvian-inspired sauce. 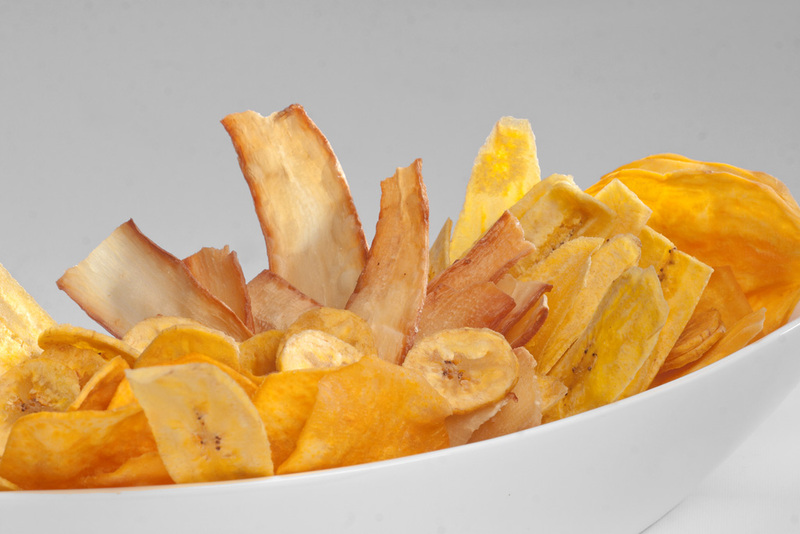 We latins just can’t get enough of our yucas fritas! I actually just tweeted that though I don’t care about American football I wish I had my own place so I can watch it just so I can host a get together and cook! Those fries do look yummy. I love fries! Maybe next year Sujeiry 😉 I don’t doubt you will have your own place very soon. OMG OMG!!! You can’t imagine how I love this!!! Yuca es uno de mis ingredientes favoritos! Yo amo la yuca tambien. Nada mejor que una yuquitas fritas! Tienes que probarlas. Y mas faciles, imposible. Yuca frita should totally overtake the French Fry. Waaaay better. My mouth is watering now and I have to try making this sauce. Thanks for the receta. Yuca never fails, is soo versatile. 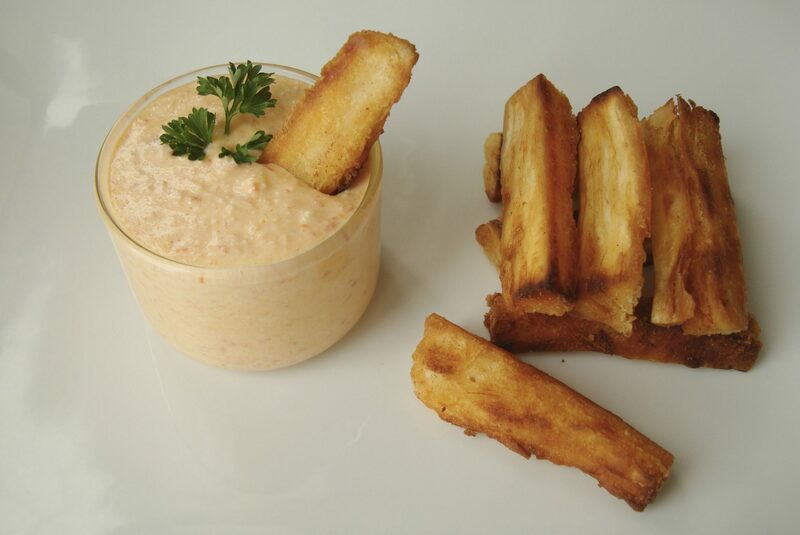 Here is a recipe that calls for Yuca and I linked back to this fried yuca post. http://hungryfoodlove.com/2012/12/10/phyllo-wrapped-yuca-gorgonzola-mash/ Thanks! Thanks for linking back to us Melissa. Yucca is wonderful, we agree. Will take a look at your blog post! Yucca is wonderful, we agree! 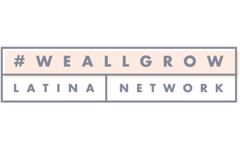 And thank you for linking back to us, we will take a look at your blog post.